Hello friends, how are you today? I want to share information about the Samsung Galaxy Pro. Samsung Galaxy Pro uses the operating system Android 2.2 Froyo. For the screen, Samsung Galaxy Pro have a size of 2.8-inch TFT-LCD capable of producing a resolution of 240 x 320 pixels. In addition to Android Froyo, the device is provided with the software user interface created by Samsung themselves. For the camera, Samsung Galaxy Pro have 3 MP camera equipped with features such as Auto-focus, geo-tagging, digital zoom and video recording function QVGA @ 30fps. In addition , Samsung Galaxy Pro have 800 MHz processor speed, with the support of 512 MB of internal memory (RAM), and internal capacity is provided with a capacity of 2GB. One that I like from Samsung Galaxy Pro is a nice shape design. 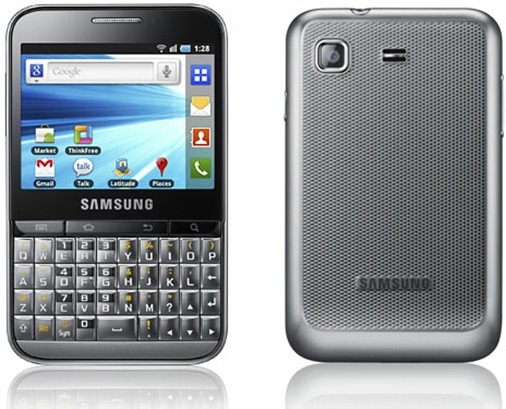 In addition , Samsung Galaxy Pro provides a Google-based features, such as Google Search, Google Maps, Gtalk, Gmail, and others. Meanwhile, to support the activities of non-multimedia, Samsung Galaxy Pro provides features such as: Microsoft Exchange, Predictive Text Input, Image Editor, and ThinkFree Editor, where you can use it to open and edit documents in MS Word, Excel and PowerPoint . I am personally interested in having Samsung Galaxy Pro. How about you?